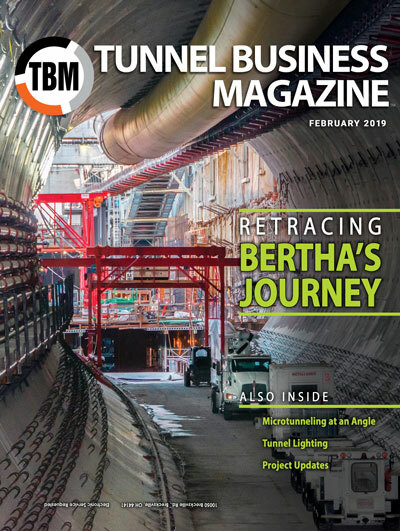 In tunneling, many projects can be deemed successful by the fact that they are completed and performing their intended function. 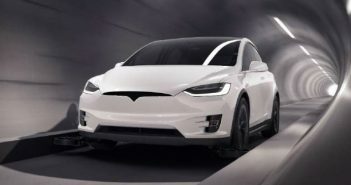 Too many times, however, these projects are impacted by cost or schedule overruns, disputes or third-party issues that take some of the luster away from the technical success. Indeed it is rare that a project comes along that is completed on time and on budget, is completed with a teamwork approach between owner, designer and contractor, pushes technical boundaries, and performs its intended function. 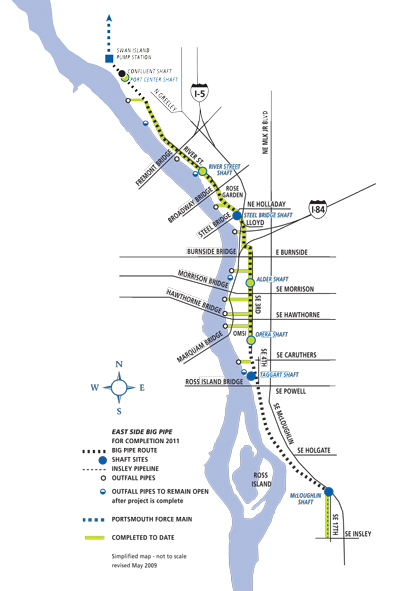 One recent example of such a job is the East Side CSO project, which was comp¬leted by a joint venture of Kiewit-Bilfinger Berger for the City of Portland Bureau of Environmental Services (BES) as part of its program to reduce sewer overflows into the Willamette River and Columbia Slough. As a result, the project has been honored with the Tunnel Achievement Award for Project Excellence. The project will be recognized at the Tunneling Short Course at the Colorado School of Mines Sept. 18-20. In fact, the East Side CSO, along with its sister project – the West Side CSO – is viewed as such a success that the contracting model used to procure it has become known as “The Portland Method.” In short, the model is a modified fixed-fee plus cost-reimbursable approach that was first implemented on the West Side CSO, which began construction in 2002. Because of the success seen on the West Side project, city planners duplicated the contracting approach for the East Side project, which began construction in 2006. Also considered was the construction manager-general contractor (CMGC) approach, which the City successfully employed on a City Hall renovation and other projects. That approach, however, also had drawbacks from the Bureau’s perspective. “With CMGC, the prime contractor is generally limited with the amount of work they self-perform. In our case, we wanted to know who was going to be doing the tunneling and who was going to be building the shafts,” Gribbon said. The contractor was selected on a qualifications basis, which factored in their proposed fee as well as their approach to constructing the project. Key to the approach is selecting the contractor before 100 percent design, allowing the contractor to provide input for value-engineering proposals and potential cost savings. The contracting team of Impregilo and S.A. Healy was selected to build the West Side CSO project. Following the successful completion of that project, the city decided to use the same approach on the East Side CSO, which was awarded to Kiewit-Bilfinger Berger. Parsons Brinckerhoff was the designer for both the West Side and East Side projects with Jacobs Associates serving as the construction manager. Once the contractor was selected, the designer and contractor jointly completed the final design. “Full project team involvement in a nine-month pre-construction services phase was essential to the project’s success,” Mariucci said. The East Side and West Side CSO projects represent the culmination of a 20-year program to reduce overflows into Portland area waterways. An order from the Oregon Department of Environmental Quality (DEQ), originally issued in 1991 and amended in 1994, required the city to control CSOs by Dec. 1, 2011. Completing the CSO program reduces CSO events from an average of 50 per year to an average of four each winter and one every third summer during very heavy rain storms. The program reduced annual CSO volume to the Columbia Slough by 99 percent and to the Willamette River by 94 percent. Work started on the first CSO projects in 1994. These Cornerstone Projects were designed to remove as much stormwater runoff as possible from combined sewers, which allowed engineers to design smaller, less expensive facilities to collect and convey combined sewage. Today the stream diversion, sewer separation, sump installation and downspout disconnection projects remove an average of 2.2 billion gallons of sewage per year from the combined sewer system. Downspout disconnections alone remove an average of 1.2 billion gallons from system annually. Construction of larger projects began in 1996 with the Columbia Slough Big Pipe, a 3.5-mile long conduit ranging in size from 6 to 12 ft in diameter. The city completed the pipeline and projects to expand capacity at the city’s sewage treatment plant in 2000 to reduce CSOs to the Columbia Slough by more than 99 percent. Construction began on West Side CSO projects in 2002. 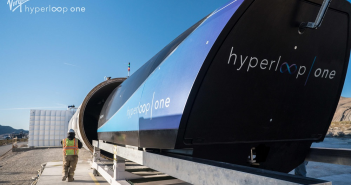 They included the 3.5-mile long, 14-ft diameter West Side Big Pipe, the Swan Island CSO Pump Station, the Peninsular Force Main and the Southwest Parallel Interceptor. The city activated the West Side Big Pipe in 2006 to control CSO outfalls on the west side of the Willamette River. Also in 2006, the city broke ground on the East Side CSO Big Pipe Project, the largest public works project in Portland history. The city completed tunneling the 6-mile long, 22-ft diameter tunnel in October 2010 and activated it the following fall. In fall 2011, the city also completed work on the Balch Consolidation Conduit and the Sellwood CSO Pump Station to complete CSO construction. The East Side CSO Tunnel Project was the largest of all Portland’s projects to greatly reduce the overflows to the Willamette River. The sewer tunnel is 22 ft in diameter and is six miles long. The tunnel route begins at SE 17th and McLoughlin Blvd. and ends on Swan Island where it is connected to the Confluent Shaft. 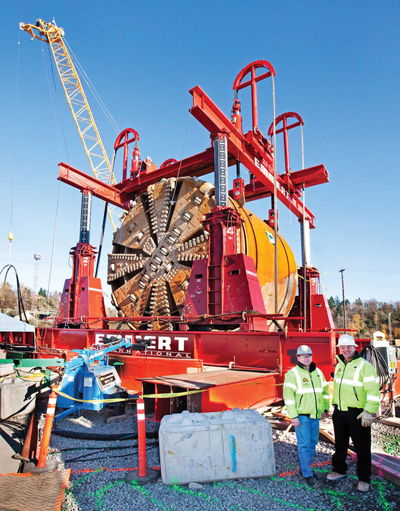 The Herrenknecht slurry tunnel boring machine (TBM) started boring in May 2007 from the Opera Shaft and reached the Port Center Shaft at the Swan Island Pump Station in October 2009. 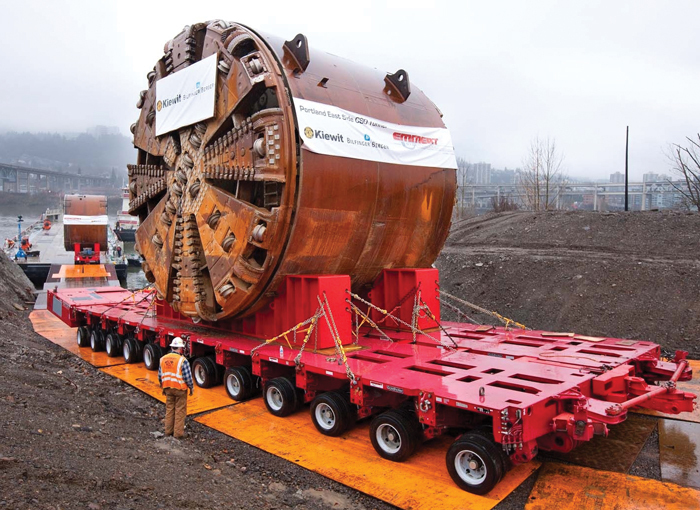 The TBM reached its southern destination from the Opera Shaft to the McLoughlin Shaft in October 2010. The Confluent Shaft (from the West Side CSO) and the Port Center Shaft (from the East Side CSO) connects to the Swan Island Pump Station. The pump station will pump sewage through the Portsmouth Force Main, a pressurized pipe Environmental Services built as one of the East Side CSO projects. The force main will discharge to an existing tunnel, which will take the flow to the Columbia Boulevard Wastewater Treatment Plant. Seven shafts were built along the alignment. 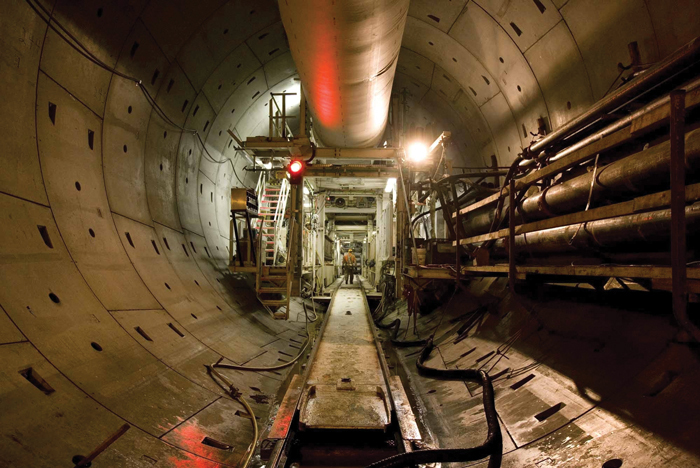 The shafts connect existing overflow pipes to the East Side CSO Tunnel and provide aboveground access to the tunnel. The shafts are approximately 49 to 60 ft in diameter and 110 to 165 ft deep. Completing seven large diameter shafts in complex soil conditions under the water table using rigid slurry wall construction and tremie slab inverts. Managing soft ground tunneling under the water table in an urban environment, including directly below interstate bridge structures. The key challenge was preventing detrimental settlement by maintaining tunnel face pressures, efficiently mining and closely monitoring instrumentation on sensitive structures. Constructing deep open-cut diversions in a congested setting. This required well-planned traffic maintenance, spotless housekeeping, just-in-time material deliveries and constant communication with affected residents and businesses. Regularly communicating to local businesses about opportunities to work on the project since this was a locally funded project. To accomplish this, the team conducted local outreach and informational meetings. Community businesses responded and successfully did the work, helping the project exceed local commitment goals. In the end, Mariucci said there were many factors that led to the project’s success. “Having an experienced craft workforce and strong field supervisors was definitely one of the key contributing factors to the project’s success,” he said. “It helped ensure we had very well-managed operations and plans that were executed at a high level. Other key factors included how well the equipment performed, especially the TBM and slurry plant. The geotechnical investigation work was very solid, as we encountered minimal unexpected ground conditions. As for “The Portland Method,” Mariucci says one of the key components is having early contractor involvement, something that is lacking from traditional design-bid-build projects in which the design is 100 percent completed before the project goes to bid. This article was written by Jim Rush, editor of TBM. Photos are by Sue Bednarz, Jacobs Associates, with the permission of the Portland Bureau of Environmental Services.